At last! Your chance to announce your unalloyed devotion to Hooting Yard by sporting an exclusive Hooting Yard badge! Hand-crafted by unpaid half-blind orphans in the dank cellars of Pang Hill Orphanage, the badges measure 25mm across and are non-edible, nourishing the spirit rather than the corporeal maw. 1. Click the Donate button to your right and send £1.25 per badge to the Keeper of the Hooting Yard Privy Purse. This includes the cost of postage and packing and the PayPal clawback. If you live outside the UK you might wish to add a widow’s mite for extra postage. 2. 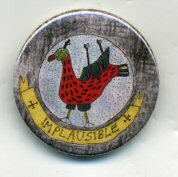 Send me an email telling me your postal address, with the subject heading “Gosh, I am breathless with excitement at the prospect of wearing my Hooting Yard lapel badge”, or words to that effect. 3. Allow sufficient time for Mr Key to drag his weary bones to the post office to complete the transaction. Note for subscribers: Sensible persons with a Hooting Yard subscription will be receiving their complimentary badge shortly, so need not lift a finger. This entry was posted in Buttons by Frank Key. Bookmark the permalink. I have mine. I shall wear it with pride. If I leave coinage in an envelope in some shady part of the ResonanceFM studio (which I frequent on the Sabbath), would you be able to leave such a badge in the same place? Like a dead drop, but without microdots, greatcoats and such. Ms Organ : As they used to say in the short-lived TV show Crisis Command, “It will be enacted!” – on Thursday next. Is it within your implausible powers to render a 360-degree view of said lapel accoutrement? If so, such a rendering might conceivably induce more geezers to splash out on one of these delights.